In case you’ve never heard of our Calabacitas recipe, you’re in for a treat. This dish is healthy, gluten free, and totaly delicious. Calabacitas means zucchini in Spanish. It consists of zucchini, (crookneck, sunburst, mixed with diced onion, roasted green chilies, fresh minced garlic, fresh corn, cotija chesse and garnished with cilantro. In order to get the best flavor in this dish, there is one step you must do even though it takes 20 minutes. It’s definitely worth every minute. Sauté the diced onion for a full 20 minutes in olive oil. What this does is caramelizes the onion bringing out it’s rich sweetness. This step makes all the difference in the world. Most recipes on the internet will tell you to cook the onions 3 to 4 minutes. Don’t do it. If you are tempted, I say, try it both ways and then you will understand what I’m saying. Also, my recipe is not spicy at all, which suits me just fine. But feel free to fire it up all you want by adding jalapeño or poblano or any chili you like. Roast them first for maximum flavor. Heat the olive oil in a large skillet over medium high heat. Add the diced onion and sauté for 20 minutes stirring frequently. Remember this is where you will develope that sweet savory flavor so don’t stop short. In fact if you went over 5 minutes it would be even better! I find that about half way through I need to lower the heat some. Don’t let it burn. Just look for a nice golden brown color and stir frequently. After the 20 minutes, add the garlic and stir for one minute longer. What an aroma! You know at this point these are going to be some delicious Mexican vegetables! Now add the corn, green chiles, oregano, and salt and pepper. Stir until everything is nicely combined and cook for 3 to 4 minutes. Add the zucchini to the mix and stir to combine. Add the lemon juice and cook the zucchini about 10 minutes until it is almost tender. You want there to be a slight crunch to it and not mushy. Remove from the heat and crumble the cheese over the vegetables and stir. 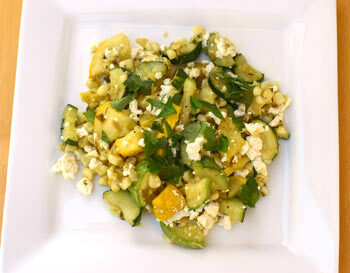 Place the calabacitas in a serving dish and garnish with the fresh cilantro. Click here for more vegetable recipes.